Do you have a family with a mix of skin and/or hair colors? Do you have children who are as different from you as the night is from the day (whether they are biological or adopted)? Do you have a disabled child who often feels out of place because of his/her differences? If YES to any of these questions, then I LOVE YOU JUST BECAUSE, by Donna Keith, would be a good book for you to get. Basically, it is good for ANY family that has young children who simply need to know you love them for who they are. This book is the 3rd in a series of board books inspired by the interracial family of the author's daughter. I love the adorable illustrations, and the Bible verses included on each page. Not only can it help your little ones understand it is okay to look and/or act differently than the others in your family, it also teaches them what God's Word says. "I know my brothers think that fish are quite a special treat. To me, they're yucky," Panda says. "I want bamboo to eat!" "Bamboo it is," says Mama, "for the panda we adore. It's part of who you are and makes us love you even more." Christ accepted you, so you should accept each other. 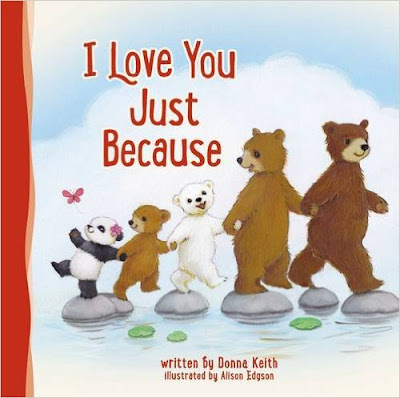 If you want to remind your kids you love them "just because you're you," this is a cute book to pick up and read with them as you snuggle on the couch. Enter below for your chance to win a copy of this book. Entries accepted until Saturday, July 30, 2016, at 8:00 p.m. CST. One entry per mailing address.